This Horn Sofa was found in a flea market in Paris and is made of ostrich leather, dark wood, bronze and horns. 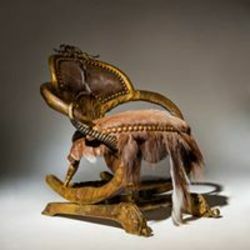 Haillard is known for creating daunting furniture composed of unique and striking animal parts as a celebration of animals and a protest against human dominance. Here, in the lobby of The Clift, it is beautifully paired with a Salvador Dali Leda Low Table-Sculpture from Barcelona Design.